Raspberries are a power pop/pop rock band from Cleveland, Ohio in the United States. They had a run of success in the early 1970s music scene with their crisp pop sound, which Allmusic later described as featuring "exquisitely crafted melodies and achingly gorgeous harmonies." The members were known for their clean-cut public image, with short-hair and matching suits, which brought them teenybopper attention as well as scorn from some mainstream media outlets as 'uncool'. The group drew influence from the British Invasion era—especially The Beatles, The Who, The Hollies, and The Small Faces—and its mod sensibility. In both the U.S. and the UK, the Raspberries helped pioneer the power pop music style that took off after the group disbanded. They also have a following among professional musicians such as Jack Bruce and Ringo Starr. 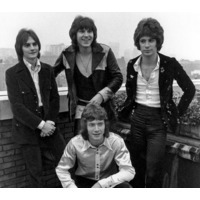 The group's original lineup consisted of Eric Carmen (vocalist/guitarist/bassist), Wally Bryson (guitarist), Jim Bonfanti (drummer), and Dave Smalley (guitarist/bassist). They're best known songs include "Go All The Way", "Let's Pretend", "I Wanna Be With You", "Tonight", and "Overnight Sensation (Hit Record)". Producer Jimmy Ienner was responsible for all four of The Raspberries' albums in the 1970's. The group broke up in 1975 after a five year run, and Eric Carmen proceeded to a successful career as a solo artist. Bryson and Smalley resurrected the group's name in 2000 and continue to tour, taking in indie pop singer/songwriter Scott McCarl working as the vocalist. In 2005, Eric Carmen rejoined the band, and then the original four-man lineup undertook a well-received reunion tour.